(China Youth Daily) "Lawyer Scandal Gate" in Chongqing Crime Trias. By Zheng Lin and Zhuang Qinghong. December 14, 2009. On early morning of June 3, 2009, the criminal gang led by Gong Gangmo and Fan Qihang initiated a bloody crime battle in the Edinburgh Neighborhood, Jiangbei District, Chongqing city in order to consolidate their leadership in the underworld and expand their influence. After the the gunshots were fired, the police found that seven criminal gangs were involved and pulled their forces together to deal with them and solve the case. After a careful campaign, the police arrested 125 persons including Gong Gangmo and Fan Qihang involved in the criminal gangs that were responsible for 25 different crime cases. The police confiscated 16 guns, 557 bullets, 2 hand grenades, one bow and 17 restricted knives. 1.5099 million yuan in cash were seized together with 465,000 yuan in bank deposits. There were also 13 houses and cars worth several hundreds of million yuan. When Gong Gangmo and the others were arrested, they were still counting on the "organization." Therefore they used resistance, non-cooperation and silence against the interrogators. Surprisingly, when the court hearings began in the People's Court, Gong Gangmo wanted to gain credit and voluntarily denounced his defense lawyers Li Zhuang and Ma Xiaojun to the police for putting him up to fabricate evidence. Gong Gangmo did so in the hope of reducing his culpability in the crimes. On December 13, the instigator of the "Lawyer Scandal" Li Zhuang was approved by the procuratorate for arrest. Thus a rarely seen "lawyer scandal" in a crime case quickly became known. In late November, the series of cases involving organized crime figures entered into the judicial phase in Chongqing. Like many other citizens, the police officers themselves paid close attention to the hearings. In Jiangbei District, the police noted that the suspected gang leader Gong Gangmo appeared seriously vexed and taciturn after he met with his defense lawyers including Li Zhuang. On December 4, after his third meeting with Li Zhuang, Gong Gangmo was especially troubled as he sat still all day refusing food and water. The police spoke to him many times and asked him to face the court hearings with a proper frame of mind. After much pondering, Gong Gangmo finally could not stand the pressure within himself and pressed the bell to summon the police: "I have something important to say!" Gong Gangmo told the case investigators about the secret that has been tormenting him for days: His wife had just hired the lawyers Li Zhuang and Ma Xiaojun from the Kangda Law Firm in Beijing. During three meetings between Gong and the lawyers, Li Zhuang taught him five tricks to "overturn the case": The first trick was to corroborate the false testimony of his wife so that he turned from "gang boss" to "victim" and "charitable citizen." The second trick was to claim falsely to the court that his confession had been extracted by torture and therefore he was recanting his previous statements. The third trick was to provide false testimony to the court so that his case can be reversed. The fourth trick was for the lawyers to read to him the statements made by his co-defendants so that he would know what to say. The fifth trick was to disrupt the court proceedings by insisting on a medical examination of his injuries so that the trial had to be postponed until a later date. Li Zhuang also enumerated a number of "successful cases" in which he was able to "salvage people" in other cities/provinces. "Did Li Zhuang tell you to do this to reduce your guilt? Why are you reporting him?" the case investigator asked. Gong Gangmo said that he thought about it himself for a long time. "Honestly speaking, these ideas from Li Zhuang can be a double-bladed sword. It may be advantageous to me. But if he is taking on my case only for the money, then I have to deal with the consequences myself. Whether this case is won or lost, he will become famous. But if I am found out to have fabricated evidence, I am the one who is unlucky!" Gong Gangmo also told the investigator about his other worry: During the three meetings with lawyer Li Zhuang, Li Zhuang asked him to sign seven or eight blank papers and power-of-attorney statements. "If Li Zhuang takes these signed papers and put in whatever he wants, then am I not screwed? If he uses these papers to take over all my assets, whom can I complain to?" Actually, even before Gong Gangmo pressed the bell, the police had already detected the illegal dealings of Li Zhuang and company. In spite of their repeated warnings, Li Zhuang continued anyway. All of this is well-documented at the detention centre. Next comes the details of this rarely seen "Lawyer Scandal" in China. 48-year-old Li Zhuang has been in the field of law for more than a decade. The Kangda Law Firm in Beijing where he works is known to have a "background." Li Zhuang who values his own worth greatly was willing to come to Chongqing to take on this organized crime because the business partner of Gong Gangmo invited him to "salvage people. But most of all he came because he wanted to make money. In late October, the friends and family of Gong Gangmo advanced 200,000 yuan to the Lawyers Office in order to "save Big Brother." But this amount was far from enough to satisfy the appetite of Li Zhuang. Under the pretext of holding a conference of experts to analyze the case, he got another 300,000 yuan. When he arrived in Chongqing, he told the friends and family of Gong Gangmo: "This case is somewhat complicated. The lawyers' fee is very low. Also I will need to make 'connections'." In the absence of alternatives, Gong Gangmo asked his people to send another 1,000,000 yuan into the account of Li Zhuang. Once the money arrived, Li Zhuang and his people began to "salvage people." During three meetings with Gong Gangmo, they offered advice. On December 3, Li Zhuang went to the Number One Middle Count in Chongqing to offer a number of fabricated issues, such as the defendant Gong Gangmo being tortured to provide a confession, the inability to meet with his client regularly, the detention location was not in accordance with the law, etc. Afterwards, Li Zhuang instructed Gong Gangmo's younger brother Gong Ganghua to invite the boss named Li of the Baoli Night Club to meet in a restaurant near the Olympic Center in the Gaoxin district. Following Li Zhuang's instructions, Gong Ganghua asked Li to close down the Baoli Night Club during the trial of Gong Gangmo. Li said that he was unable to decide by himself. So he went back to the Baoli Night Club and asked two other department heads Wang and Chen to come down to the restaurant. The three sat in the car driven by Gong Ganghua and discussed the closing of the Baoli Night Club as well as asking certain "dirty witnesses" to flee and transferring Gong Gangmo's status as the owner of the night club to someone else. Gong Ganghua told Wang: "Gong Gangmo has transferred the ownership of the night club to the man named Tang who is currently a fugitive. Even if the police finds Tang, you must say that he is the real owner of the night club." But the judicial investigation showed that the fabricated evidence of Li Zhuang could not withstand scrutiny. The "confession by torture" and "inability to meet regularly" were refuted. To set up more obstacles, Li Zhuang raised even more doubts such as the inadequacy of the evidence sent from the procuratorate, the multiplicity of statements from Gong Gangmo, etc. "The procuratorate sent photocopies of the evidence which are identical in content with the evidence presented in court. This complies with the <Regulations of the People's Procuratorate for criminal prosecutions>. The different statements were taken by different investigators during separate interrogations of Gong Gangmo, so that duplication of content was unavoidable." The case investigators said. Once it became known that Li Zhuang and Ma Xiaojun was instructing Gong Gangmo to deny his confession and fabricate evidence, the Chongqing Anti-Crime Leadership Team paid a high degree of attention and organized an investigative team from police, procuratorate, legal and judiciary personnel. The investigation team established: On November 24, Li Zhuang met Gong Gangmo for the first time and read to him the statements of the other co-defendants in the case, especially the statements made by the other principal co-defendant Fan Qihang. At the same, Li also told Gong Gangmo which other major suspects were fugitives of the law. On November 26, Li Zhuang met Gong Gangmo for the second time and said: "Based upon your materials, you must have been deceived or coerced into confessing. When the judge asks you whether you were coerced, you must admit it loudly. You must also retell your torture in melodramatic fashion. By saying that your confession was extracted by torture, you can overturn all your statements made during the investigative phase." At the same time, Li Zhuang scripted many of the "details" for Gong Gangmo to use in court: "Everything that I said before was untrue, because the police strung me up for eight days and eight nights. They beat me so hard until I lost control of my urine and feces." Li Zhuang also told Gong Gangmo in an ominous tone: "According to the statement that you made under duress, you will be executed ... if you want to overturn your statement, you need a reason." Afterwards, Li Zhuang told Gong Yunfei: "I told Gong Gangmo to say that he was tortured to give a confession. He will insist that the police beat him as well as strung him up. This is how to overturn the unfavorable evidence against Gong Gangmo." Li Zhuang also told Gong Gangmo: "When the court begins its session, I will request an adjournment in order to have a medical examination of your injuries due to torturing. If the judge refuses, I will propose that I cannot serve as your lawyer. The court will grant you three days to find a new lawyer. If you cannot find a lawyer yourself, the court will appoint one for you. Do you know what to do? You must insist on not accepting the lawyer appointed by the court. You only want me as the lawyer. Then the court trial won't be able to continue. In the case that I handled in Liaoyang, this trick bought an 18 months' delay in court!" Li Zhuang told Gong Gangmo: "I have arranged for your wife to testify in court that you are not an underworld gangster." Li Zhuang instructed me: "Your wife will say that when Fan Qihang and Li Minghang came to borrow money, it was actually extortion because you could not afford to offend those people." This served to weaken the leadership role of Gong Gangmo in the criminal organization. "From your point of view, you say that when Fan Qihang or Li Minghang called you up to borrow money, you go back and ask your wife to borrow money! Your wife said, 'Don't lend it to him.' You said, 'It is impossible not to lend him the money. We cannot afford to offend him. He scares us!'" At the same time, Li Zhuang also told Gong Gangmo not to admit to illegal activities such as peddling drugs, selling guns, running gambling dens, etc. He said: "You know nothing about the gambling dens, drug dealing or gun selling. When you are asked these questions in the court, you say 'No, I really don't know.' Just 'I don't know.' These three words say it all. Don't say anything else." Li Zhuang even asked Gong Yunfei to claim falsely through the Dazhu county Department of Forestry that the defendant's company had planted trees in order to show that he had made significant contributions to society. According to Gong Yunfei, "I understand then and I immediately got the proof according to what he said." According to the investigation, Li Zhuang arrived in Chongqing and immediately boasted that "I have connections from above." He said many times "Do you know what my background is?" "Do you know who my boss is?" and he repeated the number of "successful cases" in which he was able to "salvage people." Li Zhuang told the friends and family of Gong Gangmo that he wanted to quickly establish a "cross-regional salvage team." For that purpose, he has assembled a group of "aces" in Beijing, Chengdu and Chongqing. Because Gong Gangmo's friends and family were anxious to "salvage him" and because of the many speeches by Li Zhuang, they sent a total of 2,450,000 yuan to this "cross-regional salvage team" within a few days. On behalf of the "salvage team," Li Zhuang asked the friends and family of Gong Gangmo to pay another twenty to thirty million yuan to be paid after Gong Gangmo escapes the death penalty. But the friends and family of Gong Gangmo never guessed that their huge investment only made them look like "lambs to be slaughtered" in the eyes of Li Zhuang. In happiness, Li Zhuang sent an SMS to his colleagues in Beijing: "Here it is very corrupt, people are very stupid, and they have lots of money. Come quickly!" A Chongqing Political and Legal Department cadre told the China Youth Daily reporter that as the anti-organized-crime campaign progresses into the judicial phase, it has been a boom for lawyers to "come to Chongqing to handle the organized crime cases." Many Beijing lawyers have gathered in Chongqing to expand their "businesses" and apply "hidden rules." This official said that the background behind the Li Zhuang phenomenon is the continued existence of "hidden rules". On one hand, our country's <Laws about Lawyers> are far ahead of the other laws. On the other hand, the lawyers exercising the "hidden rules" is one of the main reasons for corruption in the judiciary. Many business people hire lawyers and pay them millions of yuan in order to save their lives or reduce the sentences. More sadly, some lawyers or lawyers' offices have even invented "internal hidden rules": once a lawyer has gotten the money, the lawyers' office will remove his name and then rehired him at some later date. Another trick is to change lawyers, by letting one lawyer be the advance party, getting the money, and replacing him with another lawyer in court. On December 12, Li Zhuang was suspicious and had returned to Beijing. He sent a SMS to a leader in the Chongqing court: "My office has decided to withdraw the two lawyers of the Kangda Law Firm from the case. We will not be the defendant's lawyers anymore. Please inform the relevant departments." That evening, Li Zhuang was summoned by the Chongqing city public security bureau. On December 13, Li Zhuang was approved by the procuratorate for arrest. (China Youth Daily) Evidence found Li Zhuang broke the law in four ways. December 16, 2009. Today, the China Youth Daily reporter got an exclusive interview with the Chongqing police. The police said that they have evidence that Li Zhuang broke the law in four ways while serving as defense lawyer in Chongqing. Firstly, Li Zhuang "read out the statements from co-defendants to Gong Gangmo." According to the police, when Li Zhuang met with Gong Gangmo met on November 24, Li "read two or three statements from suspected criminals to Gong Gangmo." During the November 26 meeting, Li Zhuang told Gong Gangmo that "the other suspects did not name him in their statements" about some of the charges. According to the police investigation, at the December 4 meeting, Li Zhuang helped Gong Gangmo to coordinate testimony with his wife. Li Zhuang said: "I want your wife to provide evidence in court that you are not an underworld crime figure. You need to cooperate with her." Secondly, Li Zhuang "instructed Gong Gangmo to recant his statement." According to the police investigation, Li Zhuang instructed Gong Gangmo at the December 4 meeting to say that he doesn't know. "Just three words and that's it. Don't say anything else." According to informed police sources, the investigation also showed that on November 24, "Li Zhuang clearly told Gong Gangmu to blame Fan Qihang for the reason and motive of the intentional murder case." Thirdly, Li Zhuang "instructed Gong Gangmo to falsely claim to have been tortured for his confession." Fourthly, Li Zhuang "instructed Gong Gangmo on how to work with him to disrupt court proceedings." According to the police investigation, Li Zhuang told Gong Gangmo during two meetings that he will propose a recess to determine the condition of the injuries on Gong Gangmo. "If the court refuses, I will walk out of the court to make sure that trial cannot continue. Under the rules, the court will give you three days to find a lawyer. If you can't find one, the court will appoint one for you. You must remember that you must insist that only I can defend you. The court won't be able to proceed." At the same time, the informed source said that the investigation showed that Li Zhuang asked the family for 300,000 yuan to get witnesses to analyze the evidence, when in fact these experts only received several tens of thousands of yuan. (China Youth Daily) "If I did what Li Zhuang told me to do, my crime will be increased and not lessened." December 16, 2009. At 15:00 on December, with the approval of the relevant authorities and the completion of all required procedures, the China Youth Daily reporter entered the Chongqing detention center to conduct an exclusive interview with Gong Gangmo, who had denounced his lawyer Li Zhuang. Gong Gangmo said: "At my first meeting with Li Zhuang, he asked me: 'Were you tortured for your confession? If you were tortured, you must say so aloud in court and demonstrate it. Then I will ask for an adjournment. The court will be adjourned. He said that in a case that he handled in Liaoning, the case dragged on for 18 months. He said that he has experience." In response to the question about whether "he was tortured for confession," Gong Gangmo said, "No." Gong Gangmo said: "Li Zhuang also read the statements from other co-defendants in the case. The point is to tell me that my co-defendants did not point to me. He also told me that another principal in the case is a fugitive. "I was quite excited to meet the lawyer. I wanted to talk about my case and ask him about what is happening. But he did not talk to me. He handed me some white paper slips to sign, and some power-of-attorney forms. I did not even get to read them because he said: 'Sign quickly, sign quickly.' Afterwards, I got very worried. What if he used these to extort my friends and family?" Reporter: "Did you have in mind to denounce him the first time that you met him?" Gong Gangmo said: "No. I made up my mind after meeting him thrice. I increasingly felt that if I did what he told me, my crime would be increased and not lessened. I was afraid that I would slip up." Reporter: "Why did you think that he couldn't help you?" "Because I felt that he was behaving improperly during our meetings. He was very arrogant when he spoke. He was quite haughty." Gong Gangmo said. "I think that I am better off being honest. If I really did what he told me to do in court, I think I will be in trouble." Gong Gangmo was also frank in stating that he had hoped to gain some credit by denouncing Li Zhuang. He said: "I thought about it for a long time. I was very conflicted. After all, he was my lawyer. But in the end, I made the denunciation even though he was my lawyer. I was afraid if I was found out, it will only make my crimes worse." "I began to work at age fourteen and I did so until now. From my heart, I support the campaign against organized crime in Chongqing. But I am in the middle of it as part of the dark evil forces. I want to caution those who come after me. I want to caution those who break the law. You should admit to your crimes and heed the law. You should lead a good life." Gong Gangmo said. (China Youth Daily) "Li Zhuang said that their clients do not get the death penalty" December 16, 2009. Gong Gangmo's cousin Gong Yunfei was interviewed exclusively by the China Youth Daily reporter on December 14, 2009. He had previously met Li Zhuang many times in Chongqing to discuss the case. Gong Yunfei told the reporter that Gong Gangmo's wife Zheng Qi looked up Li Zhuang in early November and reached an agreement for Li Zhuang to reprsent Gong Gangmo for the fee of 200,000 yuan." Gong Yunfei said: "My cousin in law called me and told me to send the money to the lawyers' office. In late November, Li Zhuang came to Chongqing. When I met with him that evening, he told me that the was able to make the court put a halt to a trial inthe case of several organized crime figures. He said that he has great capabilities, and his lawyers office has good connections." "Li Zhuang said that all death penalties will be reviewed by the Supreme Court. 'Our clients do not get the death penalty.' He said that he has very good connections. He said that he is willing to fight the cases of people facing the death penalty. 'We get more worked up with these cases'." Gong Yunfei said: "The next day, he went to the court to get the files. He met with Gong Gangmo that afternoon. We met to have dinner that night. I paid for the meal. At the dining table, he said that Gong Gangmo's case is very serious and the death penalty is a certainty unless he recants his confession in court by saying that the police coerced him. 'I just taught Gong Gangmo how to recant'." "Then Li Zhuang told me and the Chongqing lawyer Wu Jiayou that evidence is required to show the police used coercion. Wu Jiayou used to be a policeman. He paid some policemen to find some witnesses to say that the police used coercion." "A couple days later, he told that that this case was too tough. 200,000 yuan was not enough. He wanted another 300,000 yuan to find experts to analyze the evidence. The next day, I sent 300,000 yuan over." "In early December, Li Zhuang came back to Chongqing. He said that the experts have given their opinions. Gong Gangmo is not guilty of many of the crimes. This time, he wanted an additional 1,000,000 yuan because 'many things remain to be done.' This time, the second brother Gong Gangsheng arranged to send 1,000,000 yuan over." "After we sent the money over, he gave us instructions. Firstly, he wanted us to establish proof that many trees were planted by the benefactor Gong Gangmo. Secondly, he wanted us to say that we aided many poor children in order to get a sentence reduction for Gong Gangmo. Thirdly, he wanted Gong Gangmo's wife to testify that they were exploited by crime figures." "Before the hearing of the case of Gong Gangmo, he said: 'I speak to the Middle Court. In front of many leaders, I say that Gong Gangmo was tortured to give a confession. I want the court to have a medical examination right in court. If the court does not agree, I walk away.' Within a couple of days, the court sent a notice of adjournment. Then Li Zhuang went back to Beijing." Regarding his impression of Li Zhuang, Gong Yunfei said: "Li Zhuang talks really tough. When he talks, there is no room for negotiation. If anyone interjects, he says, 'I know what I am doing. You say nothing.'" (China Youth Daily) Recalling the three meetings between Li Zhuang and Gong Gangmo. December 16, 2009. Today, the China Youth Daily gained exclusive access to the testimony of lawyer Ma Xiaojun who is a colleague of Li Zhuang at the Beijing Kangda Law Firm. Ma Xiaojun was present as Li Qing's assistant in the three meetings with Gong Gangmo. According to case investigators, Ma Xiaojun recalled that the first meeting "was at 15:00 on Nomember 25. I remembered clearly that Li Zhuang read the statement by the co-defendant Fan Qihang. Li Zhuang informed Gong Gangmo that he will file a request to have a medical examination. If the court rejects the request, Li Zhuang will resign as the defendant's counsel and the court will have to adjourn. Li Zhuang told Gong Gangmo to write a power-of-attorney statement to say: 'I refuse to accept the lawyer that the People's Court has appointed for me'." The China Youth Daily reporter also learned that Ma Xiaojun recalled that the second meeting between Li Zhuang and Gong Gangmo was on November 26. "Li Zhuang told Gong Gangmo: 'You must say that you confessed because you were tortured. You say that you were strung up for eight days and eight nights until you lose control of your urine and feces. The more exaggerated the better. You must also re-stage the process of torture. Unless you recant your confession, you will be dead. In court, I will ask you when you got acquainted with Fan Qihang. You should respond to me with: 'I didn't even know his real name before'." According to Ma Xiaojun's recollections, the third meeting was on December 4. Li Zhuang told Gong Gangmo about another principal in the case was a fugitive. "Li Zhuang told him, 'Whatever I ask you in court, you reply that you don't know. Don't say anything. The more you say, the more likely you will make mistakes. But I will arrange for you wife to say certain things. You just agree with what your wife says. You must say in court that all your previous statements were coerced when the police tortured you. You must recant so that everything that you said before becomes useless." "He told Gong Gangmo how to respond to the other charges against him: 'You just say in court that you don't know'." According to Ma Xiaojun's recollections, at the last meeting, Li Zhuang gave some power-of-attorney statements and two pieces of white paper for Gong Gangmo to sign. (China Youth Daily) "I brought shame to myself and the legal profession" December 16, 2009. Today, Chongqing lawyer Wu Jiayou sent out an open letter of <Regret and Apology> to the Chongqing City Lawyers Association. The China Youth Daily reporter has seen this letter and also conducted an exclusive interview with Wu Jiayou. As a Chongqing lawyer who has been working since 2000, I should be adhering to my professional code of conduct. Yet, in the process of working with lawyer Li Zhuang over the case of Gong Gangmo, I broke laws and regulations. Even though I knew that Li Zhuang was violating the laws and regulations, I did not stop or dissuade him because of professional ethics and conduct. This will have an permanent, lifelong impact on myself. My actions have gone past the bottom lines of the law and conscience. I have brought infamy on the legal profession. I am sincerely contrite from the bottom of my heart. I have let the client down. I have let the legal profession down. I have deeply let my family down. Here I sincerely wish to apologize to the Lawyers Association and the society. Before that, Wu Jiayou was interviewed exclusively by the China Youth Daily reporter at the detention center. "As a lawyer, I should be adhering the basic professional ethics and codes of conduct. But I failed in this case." Wu Jiayou told the reporter that at the time of his arrest, the account of his lawyers' office had received 750,000 yuan from Gong Yunfei and his personal account had accepted 200,000 yuan. Meanwhile, he only has 50,000 yuan in expense invoices to show. "I did not have time to transfer the money to the lawyers office. I was thinking about doing everything once the verdict was delivered." The China Youth Daily reporter asked: "When did you receive this 200,000 yuan?" Wu replied: "It should be before mid-November." Reporter: "Until you were arrested, the money was sitting in your account for more than ten days without being forwarded to the lawyers office as you said." Wu replied: "There wasn't not enough time. I admit that this was against the Chongqing city regulations on the management of legal fees." Wu Jiayou remembered that after the first meeting with Gong Gangmo, "Li Zhuang told me that he had an argument with the police at the detention center. He told Gong Gangmo that he must recant or else he is dead." "After the second meeting, Li Zhuang told me that he told Gong Gangmo that he cannot overturn his confession unless he claims to have been tortured." Wu Jiayou said, "He kept repeating that he had successfully delayed a case in northeastern China for 18 months." "In late November, I and Li Zhuang, Gong Yunfei and Ma Xiaojun met in the lobby of the Dalang Taosha Hotel to discuss. Li Zhuang wanted me to find police officers to make false testimony to say that they saw Gong Gangmo being tortured. Gong Yunfei told me to spend money to fix things. I refused adamantly at the time." Reporter: "Why did he want you to find the connections?" "Because I worked in the Chongqing public security bureau for a number of years. I was in charge of interrogating suspects. But I was released because I was missed work too many times. I have been working as a lawyer since." Wu Jiayou said. As for the assertion that "too few Chongqing law firms are taking in these organized crime cases because they are scared," Wu Jiayou said: "I think that the main reason is that the family of the principals feel Beijing lawyers are better than local ones. Actually, some Chongqing lawyers are involved in these organized crime cases." Wu Jiayou thought that it was tough to defend the case of Gong Gangmo. "The prosecutor has very strong evidence." "I am under arrest, and I have given a black name to the entire legal profession in Chongqing." "This affair is especially tough on my family." Wu Jiayou said. "I have been married three or four years. We were ready to have children. My arrest is especially tough on her." Reporter: "Someone people say that you are a lawyer and you broke the law while being fully knowledgeable about the law. What do you think?" "I definitely knew the law and I broke it." Wu Jiayou said immediately. Then he thought again and said: "The reason why this happened is because I have lousy legal quality and bad ethics." (China Youth Daily) Li Zhuang: "I am innocent" December 16, 2009. At 5pm today, the China Youth Daily reporter met Li Zhuang in a detention center in Chongqing. Li Zhuang said: "I am innocent." 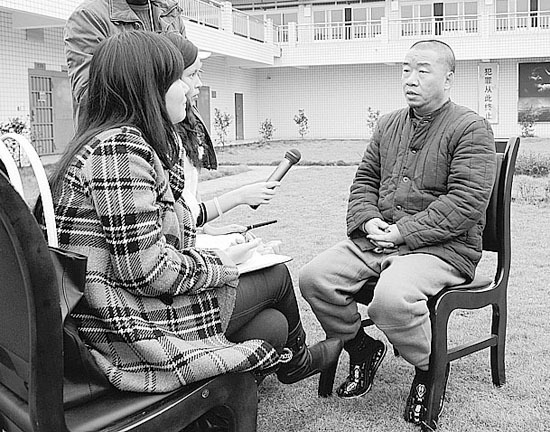 With the approval of the relevant authorities and the consent of Li Zhuang, our reporter interviewed Li Zhuang in a meeting room at the detention centre. After Li Zhuang sat down, the police officer removed the handcuffs and left the room. In responding to the question from our reporter about whether there had been any illegal activities on his part during the course of this case, Li Zhuang said: "Absolutely not. Everything that I did was with the framework of the duties, rights and obligations under the <Law regarding Lawyers>." He said: "I raised both hands for the campaign against organized crime. But crime-fighting must not destroy procedural justice. I am willing to exchange my freedom for a small step towards building the rule of law in China." (China Youth Daily) The arrest was not based solely upon the evidence from Gong Gangmo. December 16, 2009. Today, the China Youth Daily interviewed Chen Jiuhong, the deputy prosecutor-general of the Chongqing city Jiabei District procuratorate who approved the arrest of Li Zhuang. Prosecutor Chen Jiuhong said: "The arrest of Li Zhuang was based upon Criminal Law Article 306 about the defendant or his legal representative destroying, fabricating or interfering with the evidence." China Youth Daily reporter: "Was audio or video surveillance monitoring used to determine what transpired during the meetings between Li Zhuang and Gong Gangmo?" Chen Jiuhong: "No. Gong Gangmo reported it himself, and it was corroborated by other witnesses. That was the chain of evidence." With respect to the doubts about the speed by which "detention was effected on December 12 and arrest was approved on December 13," prosecutor Chen Jiuhong siad: "According to the Criminal Prosecution Laws, the procuratorate has seven days to decide to approve or not after the public security bureau makes the application. Therefore, our approval was within the legal requirements. "It took a relatively short time to grant approval because we already had the denunciation from Gong Gangmo before Li Zhuang was detained. The evidence from the other witnesses had also taken shape. Therefore, the review was relatively fast. Li Zhuang was taken back to Chongqing early morning on December 13. On the morning of December 13, we received the application from the public security bureau. Once we spoke to the suspect Li Zhuang, we approved the arrrest. "During the questioning, Li Zhuang kept saying: 'I am very professional. I have been a lawyer for more than a decade.' But he was unable to tell me just what he and Gong Gangmo talked about. On many things, he said that he forgot. "For example, when I asked him: 'When you read out the statement of Gong Gangmo, did you also read out the statements from other people?' The first time, he replied: 'No.' The second time, he replied: 'I am not sure. I can't remember.' The third time, he replied: 'I might have. I can't exclude that'." Chen Jiuhong also told the reporter that the prosecutor asked Li Zhuang: "Did you tell Gong Gangmo that he was tortured for confession, or did Gong Gangmo told you himself that he was tortured for confession?" "At the time, he did not respond." Chen Jiuhong said. "It is natural that a lawyer wants to get his client off. But he should be using legal methods as opposed to illegal methods," said Chen Jiuhong. According to information, more than twenty persons have been called in for questioning between December 10 and today. (China Youth Daily) Response to doubts about the "Lawyer Scandal Gate" story. By Zheng Lin. December 16, 2009. I have been a reporter for 15 years, but this is the first time that a report of mine has generated so much controversy. On the Internet, the Chongqing netizens are applauding. One netizen said: "You are not a Chongqing citizen. Therefore, you cannot understand how much we hate organized crime and how much we support the campaign against them." Meanwhile lawyers are mostly skeptical, sometimes vehemently so. Some journalists who are normally respectful are cursing me and calling me to say, "I cannot believe that you wrote this." A lawyer friends called me and said: "Do you know how much our right to defend our clients gets violated? The Li Zhuang case is a retaliation against lawyers." I know that the legal rights of lawyers are often violated. I have been reporting legal stories for many years, and I have reported many stories of that kind. I have made many appeals to defend the legal rights of lawyers. But to date, there is no evidence that Li Zhuang was the subject of any retaliation. Based upon what I know, Li Zhuang had met three times with his client. So there is is no issue of being forbidden to see his client. Even if meeting is hard, that is no excuse for a lawyer to fabricate evidence. Based my interview with the many principals as well as the evidence provided by the investigative team, the chain of evidence is complete. A colleague told me: "Li Zhuang may have been tortured for confession." I said: "We can have those kinds of doubt, but we need proof." At present, it would seem that the support or opposition is based upon emotions or habitual thinking. In the specific case of Li Zhuang, I think that we should go back to the case itself and the evidence. (China Daily) Lawyers ask media to be fair By Lan Tian. December 21, 2009. Journalists have been urged to remain fair and objective when covering the case of an allegedly corrupt Beijing lawyer after a "one-sided" Chinese newspaper article led to outrage among some in the legal profession. Li Zhuang, 48, of Beijing Kangda Law Firm, was arrested on Dec 13 and charged with fabricating evidence and instructing a client to lie in court. He was allegedly turned over to police by client Gong Gangmo, a suspected crime boss detained in June during an anti-gang sweep in Chongqing municipality. However, lawyers nationwide have heavily criticized a 5,000-word article in China Youth Daily on Dec 14 as it branded Li a liar before he had a chance to clear his name in court. A group of 20 lawyers wrote to the Standing Committee of the National People's Congress, the country's top legislature, and Ministry of Public Security the day after the story was published to complain. They demanded that authorities protect Li's rights as a lawyer and a suspect, and argued that police from outside Chongqing should investigate his case, which they said affected the entire legal profession. "China Youth Daily's one-sided story was based on what the Chongqing police bureau told them and went against the principle of impartiality in news reporting," Li Fangping, a lawyer for the Beijing Ruifeng Law Firm and the letter's chief author, told China Daily yesterday. "It had strong prejudice toward non-Chongqing lawyers and the story suggested non-local attorneys went to the city and defended suspected gang member clients only to make money." Chen Youxi, vice-president of the All China Lawyers' Association's constitutional and human rights committee, wrote on the association's website last week that the story had "irresponsibly and ignorantly defamed Chinese legal practitioners". The paper's staff had turned a news report into news commentary that showed self-importance, violating the basic principles of journalism, he said. The Beijing Lawyers' Association (BLA) called for calm in the capital and in a press release on Saturday said: "A person's guilt is judged by the judicial authority on the basis of facts and law." "We are very sorry that some media reporting has hurt the feelings of Beijing lawyers, as well as lawyers nationwide. We hope the press will observe professional ethics and report the case in an objective manner," the association said, without naming any media organizations. The press release followed the visit of five senior BLA officials to Chongqing on Tuesday to investigate the case and ensure the protection of Li's rights. The team left on Thursday after telling the local public security bureau and procuratorate that "the association hopes and believes Chongqing judicial authorities will deal with Li's case in accordance with the law". The authorities did not allow the Beijing team to meet Li but assured them that the accused lawyer was "physically healthy and emotionally stable", according to a BLA member quoted in Beijing News yesterday. BLA and Kangda Law Firm have referred a defense attorney to Li's family, the association said. (The Guardian) Chinese lawyer jailed for defence of alleged mafia boss BY Tania Branigan. January 8, 2010. A Chinese court has jailed a lawyer for two and a half years over his defence of an alleged mafia boss, to the concern of others in the legal profession. Li Zhuang was convicted of falsifying evidence and jeopardising testimony after a suspected gang leader, caught in a massive crackdown in Chongqing, said the lawyer told him to lie that he was tortured by police. Li denied the charges. Lawyers have complained that they are coming under increasing pressure because of the eagerness of authorities to win convictions. Several signed a letter after Li's arrest complaining that Chongqing authorities had violated his rights. The controversy over what has been dubbed "lawyer fake-gate" is the latest twist in the south-western city's high-profile campaign against gangs, which has gripped media across the country. Lurid accounts of the murders, kidnappings and beatings perpetrated by "black societies", and details of the extravagant lifestyles of their leaders, have filled the airwaves and pages of newspapers. Police say they have broken up dozens of gangs and detained more than 1,500 suspects, including their own colleagues. The city's former deputy police chief Wen Qiang is due to stand trial shortly, accused of sheltering criminals. Many of the high-profile cases have already resulted in lengthy prison sentences or the death penalty for defendants. The campaign has been welcomed by Chongqing residents, angered by the reign of the gangs, and has raised the profile of its ambitious Communist party boss, Bo Xilai. But lawyers are concerned that their job of defending the accused has been confused with support for crime. Zhang Kai, a Beijing lawyer who has been campaigning for Li, said the sentencing set a bad example and could further hinder access to defence lawyers for people charged with serious crimes. "Some people have said Li Zhuang was helping criminal gangs. But all we are trying to do is help the development of a proper legal system," he told Reuters. Lawyers have complained that the law offers little protection to the accused and their representatives, and that a provision on evidence fabrication is vague and open to abuse – pointing out it is rarely used against prosecutors. Police arrested Li late last year, claiming he had told the alleged mafia boss Gong Gangmo to lie in court by testifying that he was tortured in detention. Gong told reporters that he turned in his "haughty" lawyer because he feared the tactics would backfire and hoped to gain credit by reporting him. In an interview with a Chinese newspaper, Gong said he was a genuine supporter of the anti-crime campaign. But Li's lawyer, Chen Youxi, said in a statement posted on his website there was "no convincing evidence" against his client, who would appeal the "totally wrong" sentence. In an interview before his trial, Li told China Youth Daily: "I raised both hands in support of the campaign against organised crime. But the fight against crime must not destroy procedural justice." According to the state newspaper China Daily, Li testified during his trial that Gong had shown him wrist wounds and told him that police had strung him up for eight days. "I firmly believe Gong was tortured though I don't exclude the possibility that he lied to me," he said. Chongqing's legal authorities deny any wrongdoing and say Gong was not their only witness against Li. (CRIENGLISH.com) Beijing Lawyer Admits to False Evidence, But to Appeal. February 2, 2010. Beijing-based lawyer Li Zhuang has admitted to the charge of giving false evidence at the second trial of his case at a court in southwest China's Chongqing Municipality on Tuesday. Ten minutes into the trial, Li Zhuang told the judge at the Chongqing No.1 Intermediate People's Court that he will withdraw his appeal to the verdict issued in the first trial, which he said was based on clear facts and substantial evidence. In response to his defending lawyer Chen Youxi's inquiry, Li said he understood the consequences of the withdrawal and admitted to the charge of giving false evidence. He was also charged with obstructing a witness. He also told the court that he committed the offence in order to mislead the judicial departments, and also to seek to clear his client of gang related criminal charges. Li, however, insisted that he would continue to appeal although he admitted the grounds of his first appeal are now invalid. Li Zhuang received a sentence of two and a half years for fabricating evidence and interfering with testimonies while defending Gong Gangmo, the Chongqing Jiangbei district court ruled January 8. The court said then Li had instructed Gong to falsely claim that police tortured him into a confession, directed another lawyer to bribe police and incited Gong's wife and his employees to give false testimony. Li Zhuang, a lawyer with Beijing Kangda Law Firm, was arrested on December 12. The 48-year-old Li was implicated by his client Gong Gangmo, who faces charges of organizing, leading and participating in a criminal organization, murder, and illegally selling and transporting drugs and guns. Gong, who was produced as a witness on Tuesday, told the court he was overwhelmed by the defence lawyers' questions and did not want to testify further. Gong was then discharged from the court room. The trial is still ongoing as of press time.